Sun & Sand Sports prides itself in staying ahead of all fitness trends to offer you the best functional and high-performance clothing to suit your fitness levels. One trend that we now keep our eye on is reflective as it can be seen in fitness apparel in different forms like stripes or shapes to offer high visibility during your workouts. Browse through our online store and the latest reflective clothing and shop online with us today. Designed with florescent material to provide high visibility during the dark and even the foggiest of days, our collection of reflective clothing will appear to glow providing even daytime visibility. If you enjoy night runs, invest in reflective clothing. From pants to reflective jackets our online collection will leave you spoilt for choice. 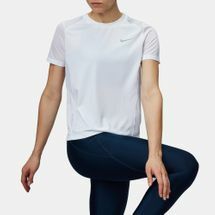 The latest in technology and trends from the likes of Nike, Under Armour and PUMA, we offer a wide range of fitness apparel equipped with reflective designs to help you stay motivated during any time of the day. Combined with high-performing technologies and innovative designs, our edit of the reflective trend will help you achieve your fitness goals. The best part about shopping from the Sun & Sand Sports online store is that you can enjoy a seamless shopping experience from the comfort of your home. No need to worry about picking up your purchases and we can have the best in fitness and lifestyle delivered to your doorstep in Jeddah, Riyadh and all over KSA. Start shopping now and invest in the growing trend of reflective clothing and lead a fit and active lifestyle.